Enjoying delicious food is as much fun as appreciating beautiful scenery during the trip to unfamiliar place. At first, you should try traditional food of the region, and then eat season food. Season food is delicious and cost-reasonable. Oyster is the famous season food of winter in Korea. It tastes great and fresh. I will introduce some oyster foods. People usually eat “oyster sashimi”, so they eat raw oyster after dipping it in gochujang(red pepper paste). 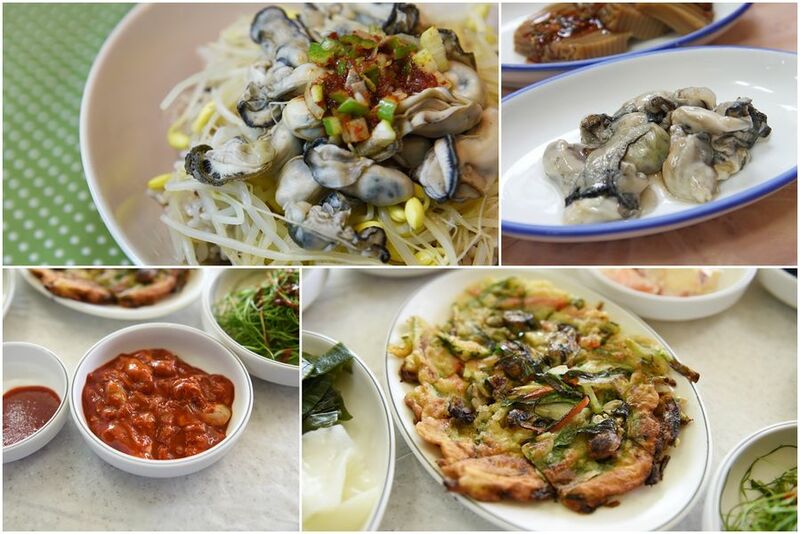 “Gul jeon(oyster pancake)” is made of oyster and dough. “Eoriguljeot(salted oysters with hot pepper)” is made of raw oyster and hot gochujang sauce. I will introduce “Gul bap(Rice with Oysters)” since I think it would be great meal for foreigners. It is made of oyster and rice. Korean people have eaten oyster for a long time given that oyster shells in the early Iron age were discovered so often. Various oyster foods have been developed in the western sea and the southern sea. In particular, Cheonbuk-myeon, Boryeong-si is famous for incredibly delicious oyster. Gul bap was originated from the food that women in the region made rice with oyster and seasoned them with yangnyeom ganjang(spicy soy sauce). In order to make gul bap, you should make only rice at first. And then put oysters and bean sprouts . Gul bap is not seasoned, so you should season it with yangnyeom ganjang made of soy sauce, dried red pepper powder and sesame oil. People usually use pot made of thick stone or cast iron. When you make gul bap with them, you can enjoy shiny and bouncy rice. Rice is chewy, oysters are moist and bean sprouts are crunch. Your mouth would be watering with slightly salty soy sauce and aromatic sesame oil. The taste is not rich but light. You can enjoy the taste of natural oyster. Korean people say oyster is nutritionally perfect food so they express it “the milk from the sea”. Winter of Korea is so cold and wind is harsh. I hope you having a bowl of delicious Gul bap and recharging your battery. Basically, people eat rice, bean sprouts and oyster with yangnyeom ganjang(spicy soy sauce). Oyster has been known as nutritionally perfect food so that people cook it with oriental medicine foods like ginkgo, chestnut and jujube in order to make it more nutritional. It has been called to oyster yeongyang bap(Oyster Deluxe Rice). You can enjoy the light taste of oyster and rice with yangnyeom ganjang(spicy soy sauce). Moreover, you can enjoy the taste of the sea when you eat with laver. Astringent laver would stimulate your appetite. Usually, Gul bap is served with thick stone pot or cast iron pot. Put gul bap in big bowl, and pour hot water into the pot. Then soft nurungji(crust of overcooked rice) will be created. Eating nurungji with eoriguljeot(salted oysters with hot pepper) is out of this world!